Sunday afternoon was just beautiful here in the Pacific Northwest! So, I decided I would join the crowds at Home Depot and buy some plants and flowers! My deck needed some spring sprucing -it was feeling highly neglected! Now, my deck is feeling less neglected! Can’t wait to get the table out there later in May! 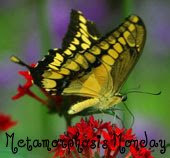 For more Met Monday posts, click on the pretty butterfly above and head on over to Susan’s! These little guys are like shower caps for your lemons! You can squeeze the juice from your lemons and the seeds stay in the net! I purchased my Lemon Stretch Wraps at Sur La Table and they TOTALLY WORK FOR ME! Oh yes! The unthinkable happened. My dinner plate dropped and left that lovely splatter on my carpet in box one. Step one – I did not panic! Instead, I thought to myself, this is going to make a great blog post! I then grabbed my camera and started documenting my cleaning experiment. Box two is step two in my cleaning experiment – scooping up the food off the carpet. Box three are the cleaning supplies I used. I started with a watered down solution of Mrs. Meyers Clean Day All Purpose Cleaner and a rag and scrubbed the carpet as best I could. Then, I took the hydrogen peroxide poured full strength on the wet rag and dabbed the remaining stains from my carpet. Next I took a clean towel and stepped on it over the wet area to absorb the liquid. Box four is the result! Gone are the stains and boy does that work for me! Head on over to Rocks In My Dryer for more WFMW posts! For WFMW this week, I would like to share my two favorite dusting buddies: Real Simple Microfiber Cloth for Dusting and my Sticky Lint Roller. These buddies work hand in hand in my cleaning regimine. When I use my dusting cloth and it gets dusty and yucky before I am done cleaning, I don’t want to shake it out and I can’t wash it yet so here’s what I do. I use my sticky lint roller and roll off the dust and then get back to dusting! Treat! Now, my sticky lint roller is a fabulous quick vacuum in a pinch as well. If I’m doing a quick clean and don’t want to pull out the entire vacuum for a little area rug (or don’t want my guests to hear me vacuuming 😉 I run my sticky lint roller over the area rugs and bathroom floors to pick up the hair and dust! You could also give one to each of your kids when company is on their way and you could have a clean looking house in no time and no vacuum sound to give you away! I keep one in each bathroom! Trick! THESE BUDDIES DEFINITELY WORK FOR ME! Head on over to Rocks in My Dryer for more WFMW tips! THIS WILL DEFINITELY WORK FOR ME! Head on over to Rocks in My Dryer for more tips and tricks! I store junk useful items in my trunk because I lack storage space due to my gypsy commuter lifestyle (living in WA and working in CA). I had an issue with these useful items flying around in my trunk (be careful when opening the trunk, items due tend to shift during takeoff and landing!) To solve this little problem, I installed a Shower Curtain Tension Rod in my trunk. You read that right! Now all my stuff stays put; I can find what I need; and I have plenty of space for more junk in my trunk 😉 and that definitely works for me! Head on over to Rocks in My Dryer for more WFMW tips and tricks!